Nowadays, knowing how to effectively manage incidents is a challenge for all types of industries. Learning how to identify, manage and prevent unwanted incidents in your organization is a must. In this five-day intensive course participants develop the competence to master a model for implementing an incident management process throughout their organization using the ISO/IEC 27035 standard as a reference framework. Based on practical exercises, participants acquire the necessary knowledge and skills to manage information security incidents in time by being familiar with their life cycle. During this training, we will present the ISO/IEC 27035 information security incident management standard, a process model for designing and developing an organizational incident management process, and how companies may use the standard. This training is also fully compatible with ISO/IEC 27035 which supports ISO/IEC 27001 by providing guidance for incident management. After successfully completing the "PECB Certified ISO/IEC 27035 Lead Incident Manager" exam, participants can apply for the credentials of PECB Certified ISO/IEC 27035 Provisional Incident Manager, PECB Certified ISO/IEC 27035 Incident Manager or PECB Certified ISO/IEC 27035 Lead Incident Manager, depending on their level of experience. 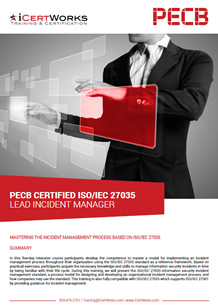 Contact us about ISO 27035 Lead Incident Manager Training!